At last an update on the Pirate Room!!! 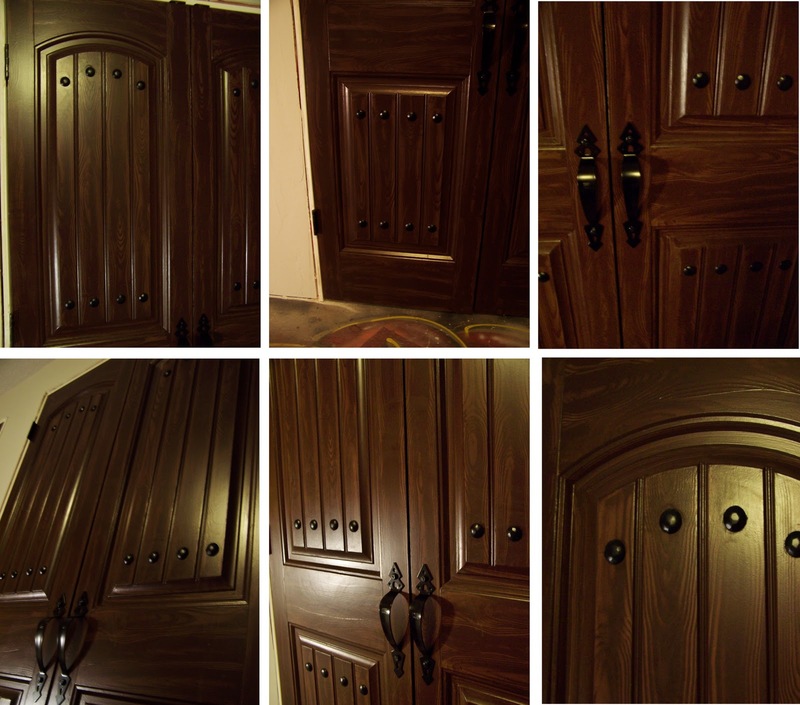 We have finally finished Pimping out the closet doors. I’m going to share how we did ours and what we learned in the process. So, last we talked these were the boys doors. Not very good for a Pirate! 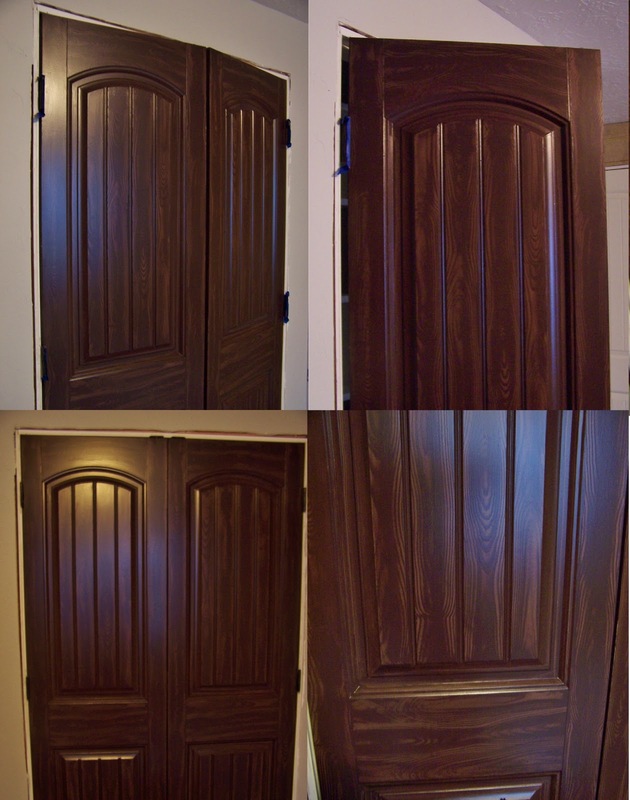 I painted the doors a chocolate brown color. so I just went with some left over opps paint my sister had. That made the first step FREE! It was flat paint but was only the base coat for the faux finish so it didn’t matter. When done the doors looked like giant Hershey bars. After they dried really well I prepped them for the next step. I used painters tape and taped off the middle, top and bottom sections. and some glaze into an ice cream bucket. but I took a picture so you could get and idea of how much of each I used. Then mix it up and your ready to start faux painting. gently rocking it as I went. 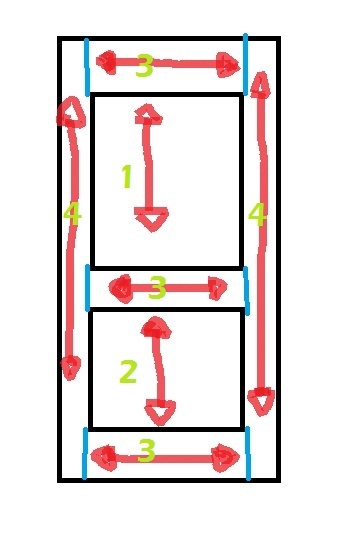 The grain needs to go the direction it would on a real wood door. Below the red shows which direction I did the graining in each section. The green numbers are the order I went in. The blue is where I put the painters tape while doing glazing step one through three. Take the tape off before you glaze sections #4. Here’s where I made my first mistake. After removing the tape I tried taping it over what I had glazed. 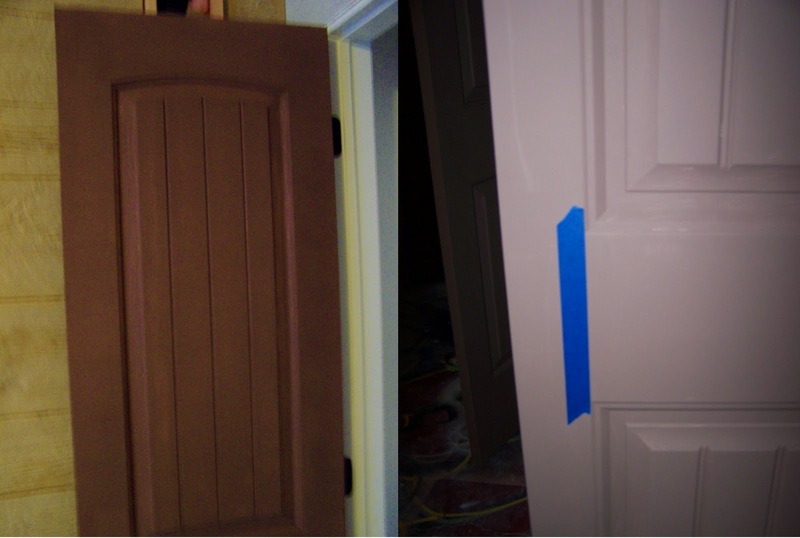 unless you want to have to go back and touch up where the tape rips off your new faux finish. So, just use a steady hand on section four. Here’s what I had when I finished this step. And here’s some tips I learned by trial and error. 1. Make long gentle rocks. My first doors I just rocked it quickly which just made the door look fake with way to many knots. 2. Don’t apply too much pressure. You want a lot more of the glazed and small amounts of the base coat peeking through. 3. Stand back and look at it often and adjust your technique. 4. Start on the back where it won’t be as visible till you really get your technique down. 5. On the edges and hard to reached parts I used the comb part of the tool. Since these parts would show the cross cut of the grain on a real wood door. After you stand back and admire your work for awhile, let this dry for a few days. Then your ready to put on the clear coat to protect it. I use Minwax Polycrylic Protective finish in satin sheen. Now we come to the part of the story that made me cry and curse! I painted the first coat with some leftover product I had from my bathroom. But the can suggest three coats. I decided I would do two. I ran out just after I started the second coat on the first door. So off to the store I went so I could finish them that Saturday night. I went to Walmart and purchased a new can for $16.22. I came home and did the last coat. After it dried it was freaking glossy. I was so upset that I had done the second coat. Then I realized that the section I had done with the first can was a nice satin finish. I decided that I had purchased a can that had been mislabled! I had just put a high gloss finish on all that hard work and it looked terrible. I was so mad and decided to call the manufacture and demand justice. I mean all that work and now I would have to sand off that shinny finish to apply a new one and probably screw up the faux paint finish. I just knew I would have to start all over. But that was Saturday and I had to wait until Monday to call. Monday morning finally came and I made that fateful call to Minwax. In case your in tears now, don’t worry the Minwax people helped fix my problems. It turns out the only difference between gloss and satin finish it a flattening agent. That agent tends to sink to the bottom. You need to stir it well and often to get it off the bottom. I also found out that I had purchased a can that was four years old!! She also taught me how to read the date code on the top of the can. that you don’t have to sand the gloss finish off. The last coat applied is the one that reflects the light. I then repainted the doors and waited for it to dry. I hope this story saves you some heartache!! Moral of the story STIR when it says stir!!! So after much ado, here they are. but we still have the iron studds to put on. You can buy real iron studs from $1.50 to $3 per stud. I needed 16 studs per door and I have four doors. that’s about $90-192 for just the studs. 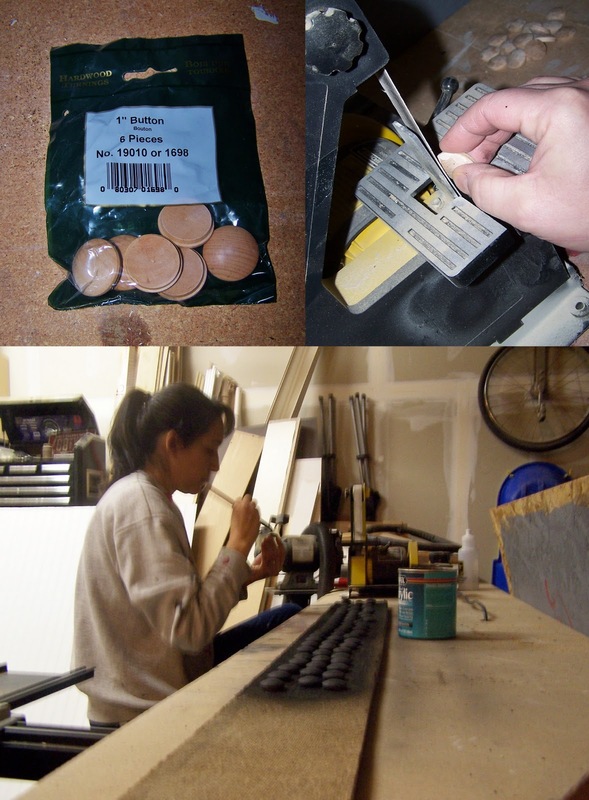 We purchased 1inch wood plugs or buttons. They came in bags of 6 at Lowe’s. They cost about $20 for all 64. That saved me about $70 to $170. Then Les sanded about 30 flat spots on each head with a belt sander. 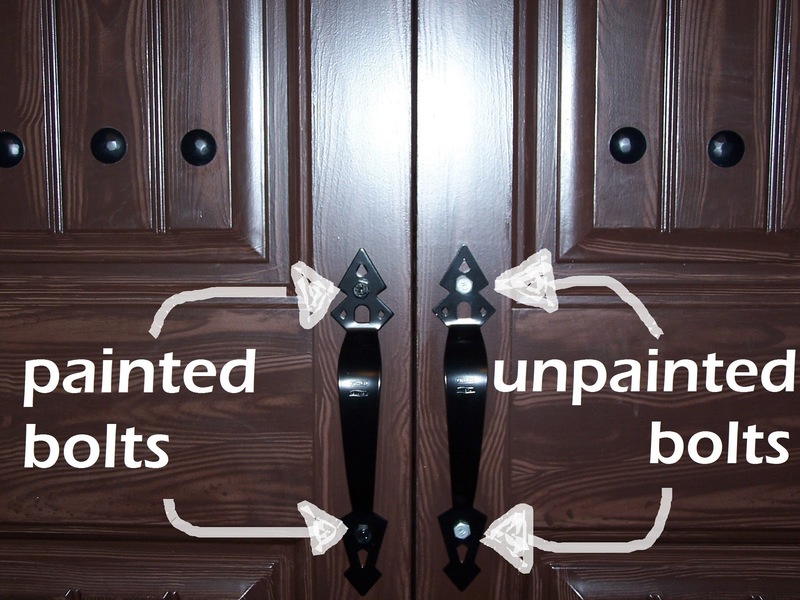 Next he sprayed them black and hand painted each one with a coat of stirred satin clear coat. Here’s what they looked like out of the package, sanded, and finished. This was totally Les’ project. 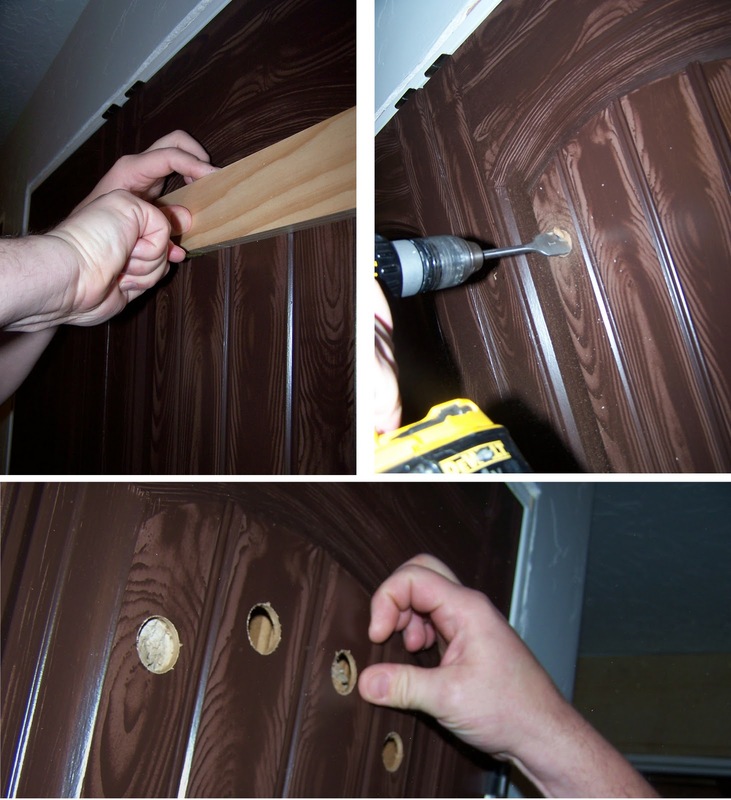 Then he drilled the holes. We had a little learning curve here also. Our last door Les got a little use to it and didn’t realize the tip had pierced the backside of the door. Les then used his thumb to clean up the fuzzies around the holes. He used his fingers to apply the glue and popped them into place. Last step was to add the handles. They worked great except we had to use lag screws to attache them and then paint the heads. So finally here’s our Pirate closet doors. and if they are of any help to any one. Well now for my favorite part. According to the guy at Lowe’s all four doors would have cost me $800 to $2000. How much did it cost us. Tell me what do ya think. I need some comments after such an ordeal!! 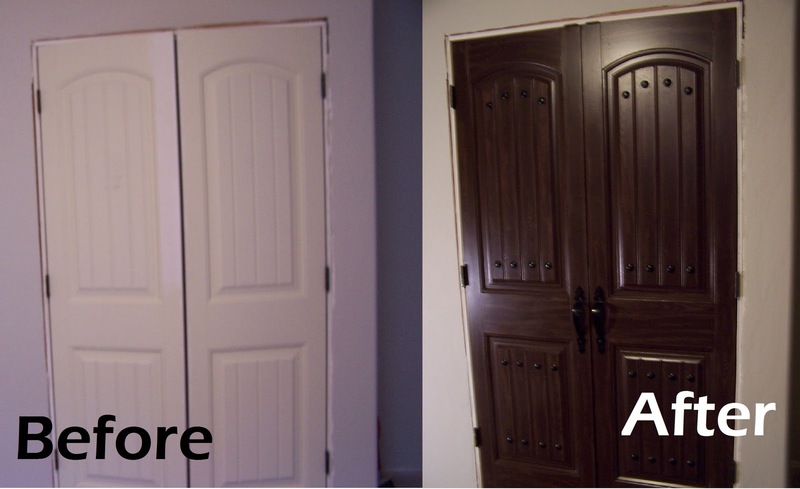 You did an impressive job of transforming these doors! Love all the details. I would be interested to know how to read the date codes on the Minwax cans. Buying out of date clearcoat never occurred to me but makes perfect sense. On occasion I have had the problem of the finish coat looking cloudy and I wonder if the product being out of date had anything to do with it. 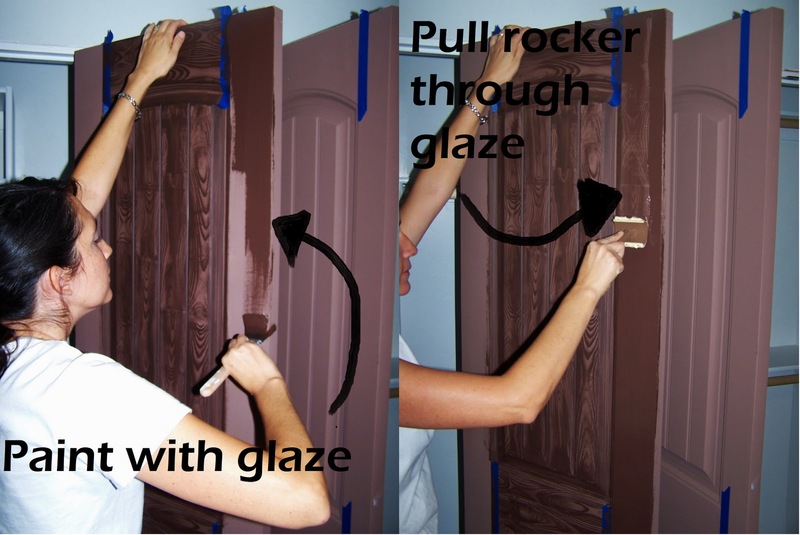 That’s the most amazing DIY door transformation EVER!!!! Hats off to you and your hubby! Your Thank you for sharing all of your hard work and TIPS, especially the ones re: the wax. Thanks for the comment, Dona! Wow! That was a lot of work and well worth it!! It is so awesome that you shared your journey to help others from not making the same mistakes. One more thing, how do you read the dates on the cans?